Etching by Abraham Castlejon of Bombardment of Cork and Kinsale, Co Cork, 1690, from Rijks Museum, Amsterdam. Etching by Abraham Castlejon of Bombardment of Cork and Kinsale, Co Cork, 1690, from Rijks Museum, Amsterdam. The Cork Bombardment was probably done from Elizabeth Fort in Barrack Street which is to be restored. It was commanded by the Duke of Marlborough. Many thanks to a reader for bringing this to attention. Legal tenure of various Estates acquired by the Land Commission in West Carbery and Bantry Bere, West Cork c 1900. Most of the agricultural land in Ireland was bought by the tenants through the Land Commission in the years around 1900. The owners were given a handsome premium on market value but had to produce title to the satisfaction of the Land Commission Examiners. These title papers are held in Portlaoise. In many cases they contain details of family settlements as well and other documents the originals of which were destroyed in the Public Records Office in 1922. 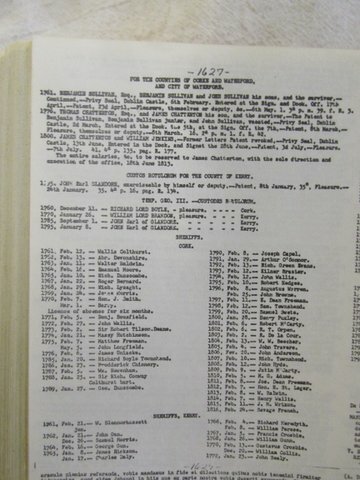 There is a comprehensive card index in the Manuscript of the National Library in Kildare Street, Dublin of title and wills. This is files by County and Barony. The Landed Estates Database in Galway which is online has good information on the various estates. The Murphy family had been Middle Men to the Brown (Kenmare) Estate at Newtown since at least the early 18th century nd later ran mills and a brewery. The house was at the back of the present Bantry Tyre property formerly Flatleys factory. His maternal side were the Jervoises a substantial landowning family at Brade outside Skibbereen. In the early 18th century they had property interests in then developing Cork City. The Jervois family were based in Brade between Skibbereen andLeap adn were also in Bandon, agents to the Bandon Estate. Total number 298 of whom 258 active. Compiled by J Chatterston, Clerk of Peace, Co. Cork, 1836. Looking at the list the vast majority are Protestants, in a County which was probably 85% Catholic, some of local families originally Catholic who converted and a small few Catholic. Apart from Landowners many are Church of Ireland clergy. At that time it was the State Church and the clergy performed many civic functions. Sheriffs of Cork City, 1761-1816. 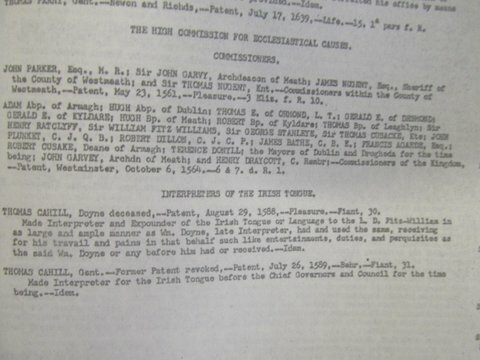 1588, Interpeters of the Irish Tongue,to the High Commission for Ecclesiastical Causes.